Live media performance art is an art form which has evolving in its current form since the 70’s. Francesca Fini is a live media performance artist from Italy and she was in India in January – February 2017, for a series of performances and performance lab in Kolkata, Mumbai and New Delhi. 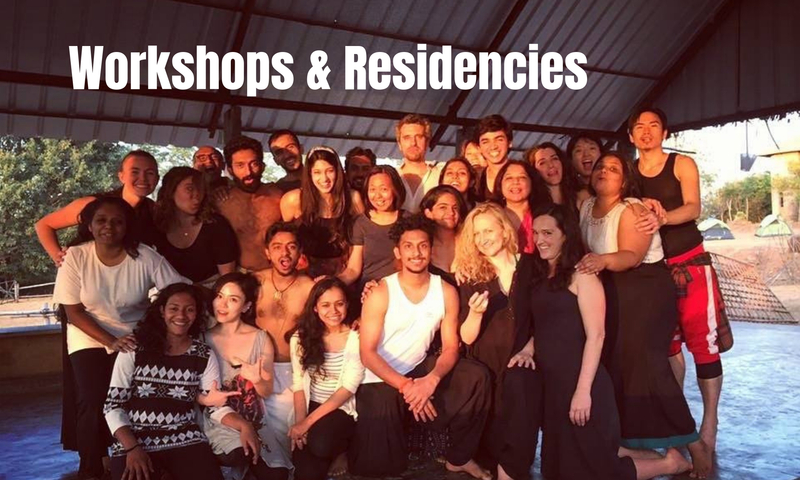 Her workshop called ‘Visionary Actions’ was held at Cube Culture, Kolkata and also at Natya Ballet Center, New Delhi. Here is a brief report based on the workshop and its reflection of Francesca Fini on performance art in general. The workshops opened up new possibilities in new ways to conceive, prepare and present performances or ideas merged aesthetically with digital technology, allowing for a new experience to emerge, which morphs the “human artist into a super human entity” within the aesthetic constructs of performance art. We experiment with the limitations and the potential of the body in a relation to the digital interface. Marked by a constant disruption of poetic fluidity and stressing on the refocusing of one’s energies and sensibilities into a new form which challenges the notions of poetics and aesthetics, it forces one to come to terms with parallel universes and of course needs a great deal of multitasking. The notion of happiness which is ephemeral is replaced by a sense of urgency to transcend reality and indeed create a new reality. The influence of the Dadaist movement is extremely pertinent in Francesca Fini’s art. However aesthetics rather the concepts are of greatest concern for her work and hence execution is most important. Her language is fundamentally that of a film maker. Live media is a kind of evolution in performance art is a language where one is elaborating a subject without a plot. Performance art is about here and now and you, and less about a memorized and enacted character. It is site and situation specific unlike theatre. It has intent and explores the space and the moment. The performer or the actor has no actorial motivation; it is a movement towards non acting. One is creating a discourse using the moment, media and space like second after second and not merely with the body. In live media performance art, the performer is constantly moving between the physical into the digital world. Hence as the computer is analyzing the analog information one has to deal with the limitations and discretion of the digital world as an important aspect in assertion of the output. In scanning the space through a technological device, new elements emerge which were previously unknown. The output quality has a randomness about it. This is an evolving process of the movement and the digital which emerges in a live media performance art project. What we do on Facebook can also be considered live media performance art project. Here, where everyone has his moment of 15 minutes of fame. Performance art triggers a new perception or experience in the audience. The ‘online’ has opened different possibilities for live media performance art to be produced and disseminated. Networked Live Performances like ‘Low Lives’, which is a festival of performance art online and several others, are now very popular in the performance art community. ‘Second Life’ which is a virtual world is now a favorite refuge of artists, particularly live media performance artists, who are creating some breathtaking and significant art on this platform. Here real people project their imagination on digital bodies and hence a new sensibility is emerging which is the body of the mind. ‘Second Life’ offers virtual spaces like ‘Odyssey’ which is a performance stimulator, ‘Machinima’, which is a platform for film makers to make films online, apparently a very useful tool for story boarding and visualization for film makers in the physical world. “Life is a loop, a movement’. Performance Art takes you beyond the limits of the physical arena and throws up different possibilities. Performance art questions and seeks to redefine the concept of ‘art’ in the present context. It is an evolving form and is changing and evolving, and is dynamic in nature. It makes the production of art very accessible. The use of simple everyday devices like wifi, mobile phone and it’s camera, motion sensing software, hacking software, closed circuit camera are used to create ‘happenings’, which are conceptual and could create very dramatic and impressive video art. The intimacy of the device form and functionality for example is creating different reactions from the subject, which at times are liberating. Had the opportunity to organize and watch the screening of ‘Ophelia did not drown’, at Bikaner House, New Delhi. This 90 minutes film is an experimental cinema, performance art based,directed by Francesca Fini & produced in association with Institute Luce Cinecittà, Italy. The earlier notable screening film premiered at the Clermont-Ferr and VIDEOFORMES International Digital Arts Festival & has been shown at the Watermill Center, a laboratory for performing arts headed by Bob Wilson in New York . Bikaner House, a restored brick & plaster heritage bungalow in Luytens, originally designed by Charles G Blomfield, an architect for the Raj as a palace for the Sir Ganga Singh, who was the Maharaja of Bikaner & a distinguished soldier & statesman. Sitting at ‘Char Bizzare’, a restaurant at the now restored Bikaner House which was given a fresh leash of life by its current owners – the Rajasthan Government and marveling at the painstaking efforts of conservation architects Abha Narain Lambah, who virtually rescued the building from decrepitude and negligence, the discussion over Kashmiri cuisine soon meandered into an animated ‘adda’ on arts & craftsmanship in design and what could possibly happen or could be done to bring traditional craftsmen to terms with contemporary arts & design. It was interesting that the original designer of Bikaner House, Bloomfield had very low estimation of the Indian craftsmen, and I quote “Indian labour is very largely unskilled; at best it is traditional rule-of-thumb craftsmanship. The native craftsman who can understand a working drawing is rare and it is not an unusual thing for the architect to demonstrate what he wants by using tools himself.” I wonder how the statement could be considered in the current context ?? Maybe not too untrue !! Now to the film which bought me to Bikaner House. Bikaner House does not have an auditorium for screening and hence the makeshift arrangements as brilliant as they were had its technical limitations, yet offered a fairly decent viewing experience. Interspersed with staccato voice overs, cult rock music of the 80’s and the most striking rendition of ‘Howl’, by Allen Ginsberg and the corresponding image of the Hippie paying tribute to the wonder of Italian art, while being derided by the working class wired to the rationality of the industrial system. One wonders the influence which Fernanda Pivano, who was an editor, journalist, literary critic & a major force in post-war Italian culture, would have had in shaping of the film. How does one approach an experimental feature. film, which break away from the familiar narrative driven structure or a poetic or dramatic language. Does one approach the subject in the film, or is the film is the subject itself. As i’ve mentioned this film has been presented as an art installation and also has been screened as a part of a performing arts residency. To approach this film through our understanding of film, would be futile, as it is clear that the experimental nature of this film is subverting the language of film making albeit subtly. It is the beginning of an attempt which i’m sure will be addressed in subsequent projects, to find neologisms and parallel universes. So i quote Nietzche here in “The basis of thought is first and foremost the act, and only secondarily the agent (Nietzsche, Beyond Good and Evil). Like one of the audience said, ‘ i think i saw Ophelia at the end in Wonderland’. The film and the performance which followed (more about the performance later), Bikaner House & Delhi, quite an invigorating mix for an evening well spent. There after a 30 minutes scheduled break after the screening of ‘Ophelia did not drown’ which stretched till 40 minutes maybe savoring the chicken kababs humus and bread, the crowd by this time has swelled a bit people returning from work trickling in. The table was laid with five cat iron bowls with dry color power, the kind used for the festival of ‘Holi’. Francesca is ready the lights turned out in the hallroom, which of course doesn’t drown the hall in total darkness quite to the contrary the majestic chandeliers in the anteroom refuses to back down and flows through the glass doors to live this day with ‘Blind’ by Francesca Fini. This is a low fi live interactive act by Francesca Fini a basic web cam interacts with her act, and lets her laptop software render abstract graphics & sound which are pre-configured to respond to stimulus of colours. Francesca starts with painting herself in black and then uses the colors – green, red, blue & yellow to start the dialogue with the digital. The starting graphic in which a post human model emerges from within a matrix, to take this journey through the cosmos to the sun in a whirling dervish movement, a style which is a recurring essence of Francesca Fini’s philosophy of art. Soon she blindfolds herself and much like a street performer or a magician continues with the dialogue lost as she in her inner world, but constantly aware of the position of the camera and the buttons on the laptop. What emerges is dynamic art which is edgy and provoking, it submerges me into a vortex of thoughts which the performer is not aware of. She doesn’t know anymore about the space or the audience, she is in a dream world, as we – the audience are privy to it. The act disorients the audience’s expectation as the performer always stays in the non acting mode and the the graphics or sound is bereft of the poetic fluidity which one may have have expected of a performance. At the post performance chat most of the audience said that they had never seen anything like this before. Someone asked about the significance of the colors to her personally, Francesca Fini explained that the colours are signifier of various sites of memory.